Dressed in a bright pink t-shirt that says ‘Thank you for loving me’, four-year-old Kompok steps gingerly on a scale to be weighed. She looks down with curiosity as the numbers on the display rise. Oun Phearun, an outreach worker at SOS Children’s Villages Cambodia, notes Kompok’s weight – 11.1 kilos – in his records. She has gained a kilo since her last check-up a month ago. He stretches out a measuring tape to check her height. She is growing too. When Mr Phearun first met Kompok in February 2017, she suffered from serious malnutrition and pneumonia. With the support of a malnutrition centre run as part of an SOS Children’s Villages Cambodia family strengthening programme, Kompok has regained her strength. Mr Phearun checks on Kompok's height and weight. A routine visit to the community by an SOS field worker most likely saved Kompok’s life. Kompok and her family live in the farming village of Taphlen, an indigenous community where SOS Children’s Villages Cambodia works to improve the lives of some 70 families to prevent the abandonment and neglect of children. Programs to help people start their own businesses, from fish and chicken farms to small-scale farms, have increased incomes for some families. An SOS community center serves as a kindergarten, school and nutrition centre. At the time, Kompok’s parents, both day laborers, could not afford to follow a local doctor’s advice to bring her to a children’s hospital in Phnom Pen, Cambodia’s capital, an eight-hour drive away. Not knowing what to do, the family decided to carry out a local custom to sacrifice a pig to the guardian of the village, praying that their daughter be spared. By chance, the SOS field worker heard the cries of the animal and interrupted the ceremony. 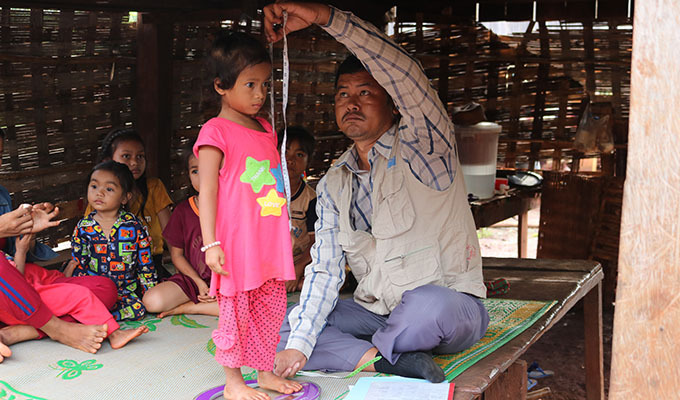 Seeing Kompok’s condition, he offered another solution: to bring Kompok to the hospital for immediate care and then admit her to the malnutrition center at the nearby SOS Children’s Village in Ratanakiri. 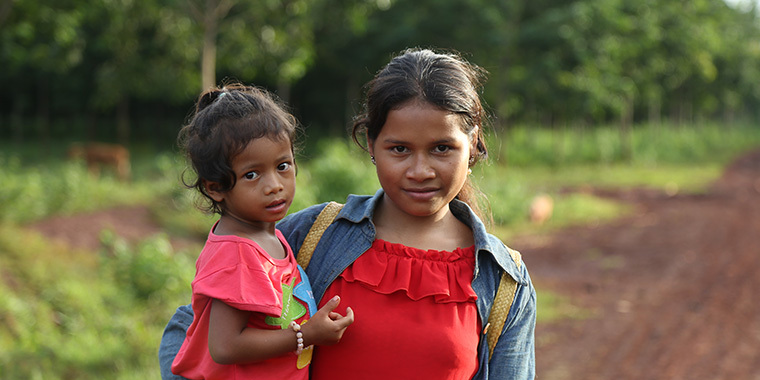 The malnutrition center, started in 2012 by SOS Children’s Villages Cambodia, serves the entire province of Ratanakiri, a remote area where many indigenous people live in relatively isolated villages, including Taphlen. SOS Children’s Villages works with local authorities to identify malnourished children under five where there is a threat to the life of the child. The children are typically 40% under their normal body weight. With the parents’ agreement, children usually stay at the center for three to six months. In the meantime, SOS Children’s Villages works with the parents to teach them about proper nutrition and hygiene with the goal of improving the conditions that led to the malnutrition in the first place. Having the sick child stay in the center also provides a respite for the family from caring for an ill child and struggling with medical bills. To date, more than 300 children have been nourished back to health. Many problems facing families in the village of Taphlen have improved through the support of SOS Children’s Villages Cambodia over the past five years. With the support of SOS Children’s Villages, residents have built a new main road, sewage and drainage systems, a water supply and toilets for better hygiene, and solar street lamps. Taphlen has been called a model village by local authorities and SOS Children’s Villages Cambodia intends to replicate its work in other nearby communities, says Dr Dareen. Back at Kompok’s home, her mother Mosac has cooked a healthy lunch of green vegetables and rice. Kompok’s sits on a bench, enjoying every mouthful.